Yes, the camera, she is dead. Fortunately, I was able to plug the memory card into my printer and download the pictures. Good printer! 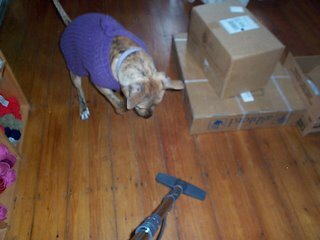 Here are a few pictures of Wanda confronting her archnemesis, the vacuum cleaner. Isn't she cute in her sweater? I really have to hurry up and make her a thicker one. She was actually shivering outside yesterday. Anyway, all you tech savvy people out there, what kind of camera should I get? 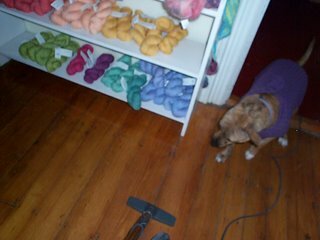 I'm looking for one that is fairly light weight and will take good pictures of the yarn. I would appreciate any ideas that anyone has. She looks great! Mine isn't exactly light, but I really like my Canon Powershot S3! Pick your favorite PowerShot from Canon. When you're ready to buy, let me know, and we may be able to work out a deal. i have an old cybershot from sony. nothing super cool, but it was cheap, and it does a surprisingly good job! I have a canon powersomethingsomething, and it does the job well, although there is serious lag time between when you push the button and when it takes the picture. Decide how small you want it to be, and go from there; beyond some point high megapixels are only very useful if you are going to crop the photos a lot. In my fairly limited experience, go for a higher optical zoom; don't rely on digital zoom, as it is, how shall one say...crap. I have a Canon Powershot A350 and it's okay. The lag time is a little too long between flash photos and the lens angle isn't wide enough for me. It does take great pictures though! cnet.com has great reviews of cameras and you can really comparison shop. Everyone is discussing cameras, and I want to comment on Wanda's sweater. Did you put a little ruffle at the top of the back? 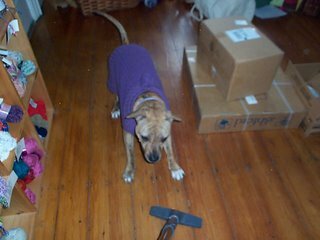 She's very fetching in her attire, and I still think that you could do high-end doggie knit fashion. How about a little hat for the girlie's ears??? I am coming back to the US on 12/23. I can't wait. I have had far too much of Russia. FAR too much. I'll be flying through Boston. Will you be open on Saturday, 12/23? I'll try and write on your regualr e-mail. Hope you're well. wanda's beautiful sweater gained a ruffle in a moment of unorthodox, yet inspired tayloring of "the finished object that doesn't quite fit..." she looks just dashing in it, if i may say so. Wanda looks great in her sweater! Very lucky dog indeed.